The pyramid of employee engagement offers a model of the 10 blocks of employee engagement. Here is a link to a 50 page booklet on the pyramid. There are 10 posts in this series. 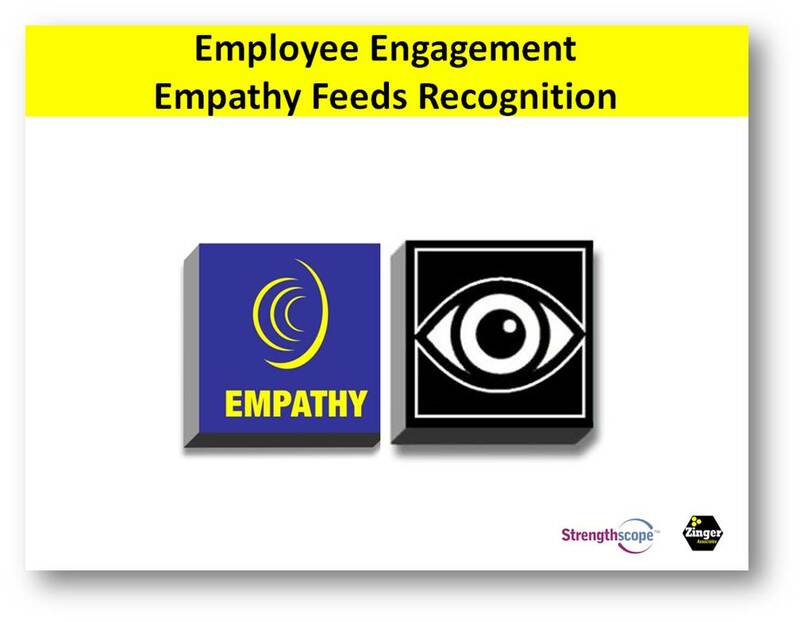 To learn more with a chance to be interactive on strengths and engagement plan to attend an educational workshop in London on the importance of strengths for employee engagement and a fusion of the pyramid of employee engagement with a strength-based approach to work. See the workshop details at the end of this post. Martin Seligman, the former President of the American Psychological Association has made phenomenal contributions to happiness and wellbeing. His recent book, Flourish, is an examination of how we can have a positive impact on wellbeing. I believe that we must find wellbeing inside of work and that it is more integral to who we are and what we do twenty-four hours a day than only something we do after work with a period of meditation, a healthy meal, or a short jog. Engagement and strengths are vital contributors to wellbeing. Seligman believes that the five contributors to wellbeing are positive emotions, engagement, relationships, meaning, and accomplishment. These five sources of wellbeing are available to us inside of work. 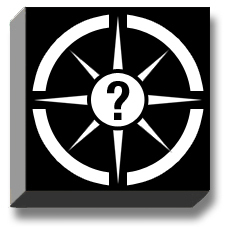 In addition, strengths turbocharge these five factors. Seligman and others in the positive psychology movement have demonstrated that when we know our strengths, use our strengths on a daily basis, and leverage our strengths in the service of others we will enhance our personal wellbeing. We will get a phenomenal return on our energy invested in well being when we attach our strengths to create positive emotions, experience engagement, participate in relationships, develop meaning, and accomplish desired goals. 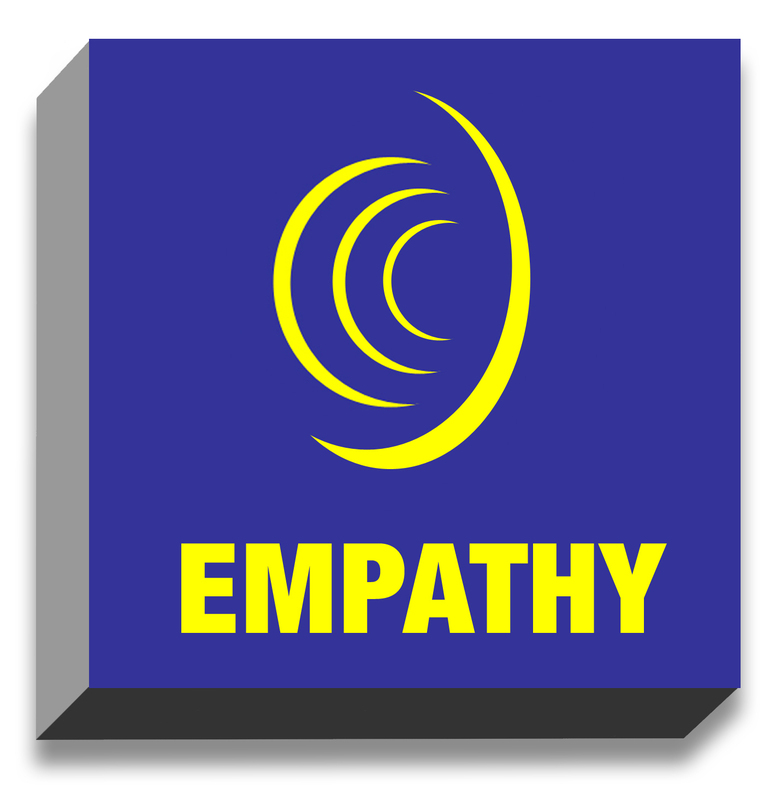 Seen from a wellbeing perspective, my seven significant strengths of leading, developing others, enthusiasm, self-improvement, creativity, flexibility and empathy are good medicines for me at work. I encourage you to work towards being well by drawing deep upon your strengths by bringing them to the daily surface of work. The pyramid of employee engagement offers a model of the 10 blocks of employee engagement. Here is a link to a 50 page booklet on the pyramid. After completing the strengths inventory, Strengthscope, from Strengths Partnership in the UK, I have embarked on a systematic application of my 7 significant strengths to each of the 10 blocks of the pyramid. This will make the engagement work more robust while also enhancing wellbeing through the application of strengths in the service of others. There are 10 posts in this series. 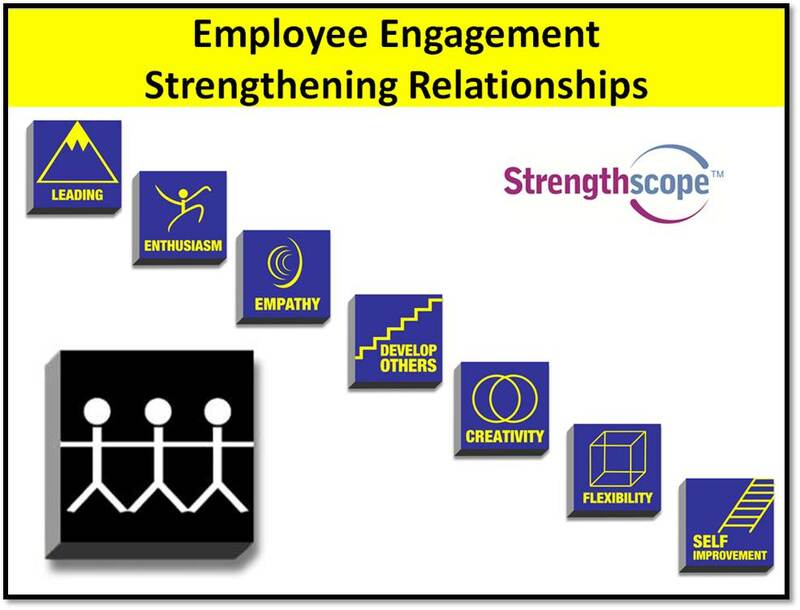 To learn more with a chance to be interactive on strengths and engagement plan to attend an educational workshop in London on the importance of strengths for employee engagement and a fusion of the pyramid of employee engagement with a strength-based approach to work. Here is information about the workshop followed by an outline of strengths applied to performance mastery. 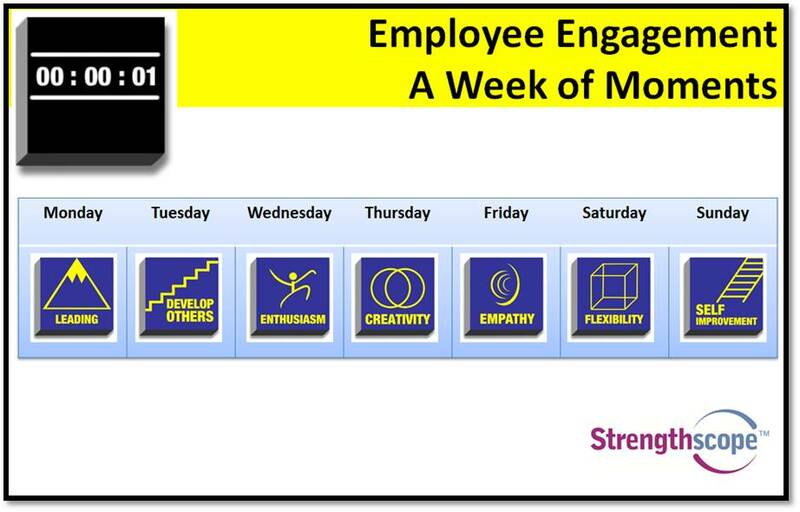 One thing I appreciate about the Significant 7 Strengths is that you can work with a different strength each day of the week and our strengths can be applied at work and outside of work. The tool above is a weekly calendar or strength nudge to help me focus on one specific strength each day. It ranges from Leading on Monday to Self Improvement on Sunday. I find that most of us are so busy we often fail to utilize our strengths because so many other things crowd out their application to our daily work. We suffer from strength myopia. Rather than attempting to apply all 7 strengths all the time this calendar encourages me to focus on just one strength each day. 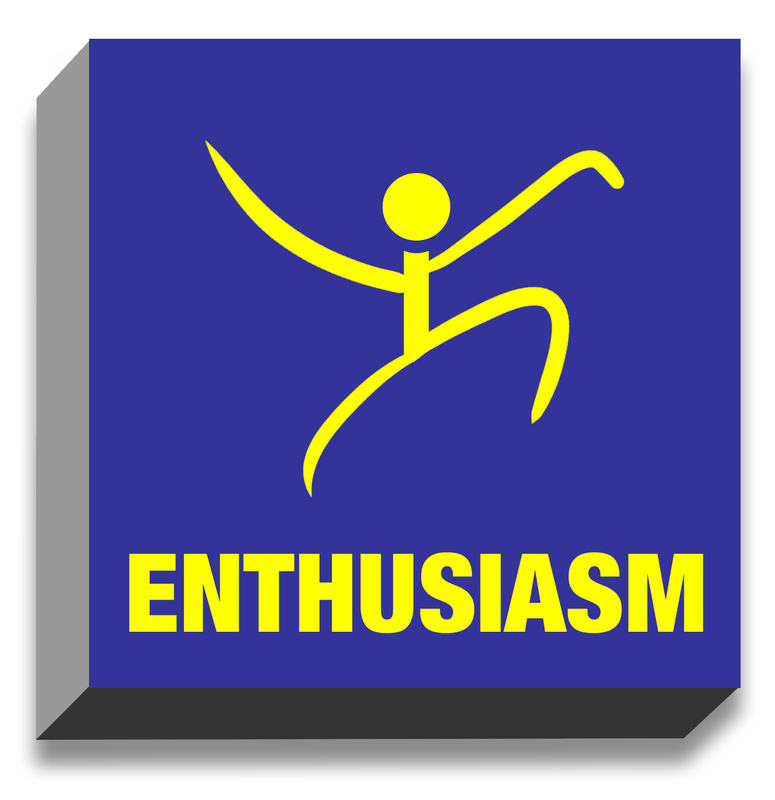 For example, I will post a sticky note on my computer on Wednesday morning with the strength cue question for enthusiam: How can I demonstrate my strength of enthusiasm more fully today to enhance my own engagement and foster the engagement of others? What’s on your calendar at work? Grow strong along with me, the best is yet to be!